Controversial choice of trip, but found to be extremely satisfying! 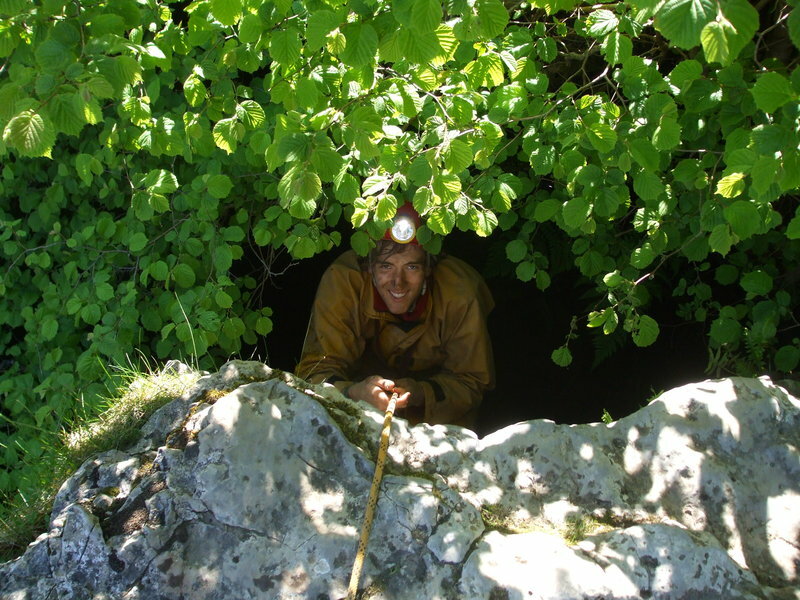 As it wasn't in selected caves, opinion varied from "OK if it's dry..." to "Impossible! Those pitches are rigged for pull-through only, blah blah blah...". And it was almost perfect weather, nice and dry, though it had been raining in the previous weeks. Our original plan had been Penyghent Pot, but after I strode over from Clapham train station, bright eyed and bushy tailed after my visit to Leeds, I found the motley crew rather the worse for wear thanks to the previous night's festivities that didn't really seem that festive to a non-drinker. (Vomit, Vomit). Anyhow, we had a rather large and mixed team, so the Kingsdale exchange turned out to be a stonker! I was in the Swinsto team, and the trip took a dive for the worse when I checked the time when barely 5minutes into the cave, waiting at the bottom of the first 5m comedy pitch, and realised to my horror that the watch was gone! The strap had been acting a bit dodgy the last couple of weeks, but I had ignored it... and now all was lost. So after getting overtaken by the last two people, and getting rather wet ferrating around in the plunge pool, I prussic'd up slowly, checking all the ledges, nooks and various crannies, checking the rebelay ledges and little folds in the rock that the water rolls over... then crawled slowly back up the waterway digging down into the rocky clefts, moving the pebbles and checking up high in the abandoned beeding plane in case it had fallen off as I shuffled sideways... No sign, no luck. In the streaming sunlight I checked around where we got changed, and where I had a pre cave slash... but to no avail. Just a cheap Timex Expedition, with a replacement black nylon scratch, but the scoured dial had seen me through a fair few summer expeditions, a 3500nm cicumnavigation of the Eastern Atlantic, and had got me reliably to meetings, trains and planes. Sob. Rigging was fine and off P-bolts in the most, except for the big split pitch (60m rope) which required two plates for the far further-out Y-hang necessary for a dry-ish descent. This pitch also required dubious sling around a 'natural' (aka. nib of rock the size of a finger in the first case) deviations on both bits of the pitch. Following the big one, suddenly some actual caving to be had - clambers, stoops, and a few curious bits of route finding as the stream disappeared and you were left high... Last pitch saw a snazzy little 20m drop down a cleft, a bit more clambering and then we were in the Great Aven. And with perfect timing - Tet shot around the corner and bellowed up on the off chance, to be replied by Dan who was just descending from the top! Ate our choc, gossiped, popped down to the Master Cave with our last bit of rope, smoked, and then parted ways and headed out. Great aven was nice enough, but the lads had (due to a rope they expected to be short) rigged directly through the squeeze. It wasn't much of a challenge, just a cut-off in terms of chest dimension + calcification. Leo had serious issues, which were unresolveable - so Tet clambered up the P-bolts and slung a rope down the perfectly open + pleasent pitch head at the top. A note for next time - climb high! Rigging in Simpson was rather more sorry, though to be fair they had inferior knowledge to base it on. Don't underestimate the number of small ropes you will need. They had to cut the final rope twice to get to the bottom. Also be warned that a lot of these pitches do not have traverse bolts. You're generally dismounting into a rift, so it's not at all difficult but it can be a little psychologically taxing. Think of it as the kind of place where on expo the first couple of teams take a chance, before the next wave say something along the lines of "For Frigg's sake, someone's going to get injured here for want of 20minutes effort" and then put a bolt in. Once through the Duck (not too blowy, underwater unobstruction tries to stop you escaping on the other side though! ), I plunged straight on into the sump (thigh deep with a tackle sac accelerating me down before my other leg crumpled onto the foot). Reconsidering the situation, and remembering Dan's telling that he had also done the same on the way down, I double backed and climbed over the top. Nice set of split pitches, plenty of rope. Very quiet, pleasent bit of cave this. Turned off my light and snoozed off listening to Gergely derig. Another comedy bit of rigging was the 30m+ rope to rig a ~6m drop which had a (dubious) permanent hand line. Don't underestimate the necessary tat to rig this either. Last few 'steps' out were pleasent enough, then rift with water, then crawl, then a little junction with lots of dead ends, then the final crawl until the sky suddenly opens up above. Last spot of direct sun as it set below the hill, then wandered down past Valley Entrance to the waiting van. The pull through is a bit of a waste of a Saturday, the exchange was far more demanding, and with the challenge of thinking through the rigging made it an enjoyable trip for all. Brilliant weekend and a stunning weather. Have never seen Yorkshire for two days totally sunny with no clouds on the sky. We had a proper Friday night party. Going to bed at 4 AM and up 9 AM. Quite good, I would say. We start packing ropes and soon we were all off to Simpson - Swinstow exchange trip. We split in two group (6 in each). We were out in 6,7 hours and still catching last sunshine when changing. The next day, team keen went to do the Link-Cow exchange trip, while others rather like to enjoy proper summer day up the Ease Gill valley. Swimming was included, specially after William accidentally slides down from the rock straight into the pool. This time was really hard to leave Yorkshire.